Cyclone24 recently launched their corporate cycle network, holding monthly cycle rides from Cardiff. The inaugural ride was sponsored by Stills and took place on Friday 28th April. 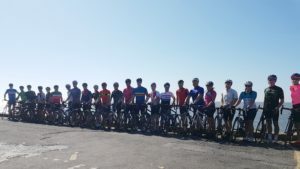 15 cyclists from businesses across the city joined Cyclone24 Director Zoe Westerman for an early morning ride around the Vale of Glamorgan, followed by breakfast at Kin & Ilk, Pontcanna, kindly sponsored by Stills. Zoe commented “Our corporate rides are a great opportunity to meet fellow cyclists whilst providing friendly networking opportunities”. Rides typically cover 20-25 miles with a longer ride planned for the summer months. The next Cyclone24 Corporate Ride is taking place on 26th May and is sponsored by Capital Law.